Situated between Los Angeles and Santa Barbara in the beach town of Oxnard, the club is an ideal venue to host corporate events, wedding receptions, business meetings, fundraisers and much more. 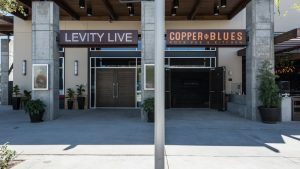 Just off the 101 Freeway in the Collection Riverpark shopping center, the club is a combination comedy club and a music venue (Copper Blues) and can collectively seat up to 700 patrons. There are a variety of food and cocktail choices served both inside and on an outside patio with fire pits. Plentiful parking is available in the adjoining mall. With the latest in technical capabilities including a digital wall, the club is able to facilitate different types of presentations as well as support both live music and DJs. World class talent can easily be booked from the greater Los Angeles area.